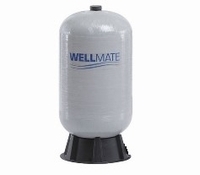 Description: The WellMate WM-6 is a rustproof pressure tank that is made with a blow molded, fiberglass wrapped, seamless construction. They won't rust, dent, or come apart at the seams, and a rugged base is included. Volume: 20 Gallons. Equivalent in drawdown to a 42 gallon galvanized atmospheric tank. Drawdown: 6.7 Diaphragm: Made of heavy-gauge polyurethane (Separates air and water). Air connection: Standard tire valve. Precharge: 24 PSI Maximum operating pressure: 100 PSI Maximum temperature: 120 degrees Fahrenheit Connection: 1" MNPT (Male pipe thread) Carton dimension: 36" H X 20" W X 20" L Weight: 20 lbs. Warranty: Factory 5 years warranty period for potable water residential installations and 2 years for non-residential installations. System components specifically pre-selected to meet a typical seven minute peak demand based on a 1 to 1-1/2 bathroom home when pumping from 15' suction lift with a 30-50 PSI working pressure, 1/2 HP 115/230 Volts Goulds . What is the warranty on WellMate tanks? All WM WellMate tanks carry a five year limited factory warranty for potable water residential installations and 2 years for non-residential installations. No, unfortunately there are number of factors that can contribute to a failed tank and the only factor that WellMate can insure is the tank. How much pre-charge should I have in my WellMate tank? Your tanks should be pressurized to 4 PSIG less than the cut-in pressure setting (for example, if your pressure settings are 30/50, then you cut-in pressure setting is 30 PSIG and your tank should have a 26 PSIG pre-charge). How do you check or change the air cell pressure? To check the pressure in the air cell, the power supply to the well pump must be turned off and the water must be drained from the pressure tank.. With the pump turned off and the water drained from the pressure tank a standard tire gauge can be used on the valve stem at the top of the tank. The pressure in the air cell should be 4 psi lower than the pump cut-in pressure.